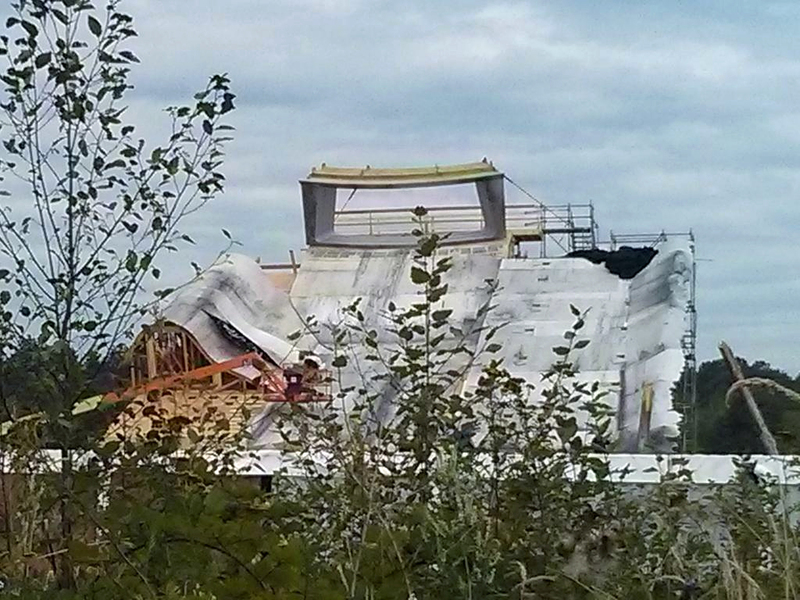 Some Kind of Star Trek: Beyond a Joke? There are 104 days left until Star Trek Beyond hits UK cinemas. So why is it that we're still devoid of pretty much anything at all in the way of promotion? To recap to date we have one very un-Star Trek trailer and two photos only one of which is actually from the movie, the other is behind the scenes tomfoolery. On reflection by this time with Into Darkness we had three trailers - two long running and one slipped into the Superbowl ad break but with Beyond we really are in darkness. Are Paramount afraid that blowing the trumpet as much as they did with Into Darkness is a bad thing seeing as how that movie was received by fans (but a notable success with the mainstream audience) or are they simply waiting for a more suitable time to hit us with a full power campaign once Batman Vs Superman and Captain America: Civil War are out of the way (for example). What we've seen already plus the reshoots doesn't instil confidence so far but early days however the fact that we are now in April and July is ever so close is worrying. By this point a lot of movies seem to have their trailers out and the big countdown is beginning whether we expect them to be or not (see Batman Vs Superman once again). Just remember though that this time three years ago we were days away from the premiere of the second reboot and that might actually be distorting our vision on when we should be seeing footage/trailers etc. If we go on that as the example then it was just a month before that we got any seriously juicy trailers, posters and the viral campaign was barely a couple of weeks before (check out the posts from March and April 2013 on Into Darkness to see just how much it ramped up). Who knows if they'll chance another Are You the 1701? Don't forget that we also had the charity campaign where you could win a chance to go on set but that was before the advertising machine started up so we can't really count that nor can we include those tantilising set pics of a crashed starship (I don't want to say it's the Enterprise but...) nor those of apparent crowds of Federation citizens mingling in Dubai. Again more pre-promo than actual release promotion material. That trailer did the upcoming movie no favours but the pics that followed did even less. 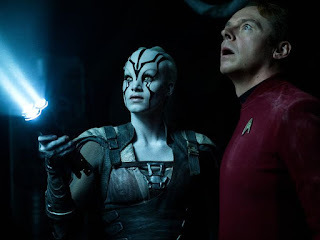 The non-descript shot of Sophie Boutella's still unnamed alien character and Simon Pegg's Scotty staring into darkness (yes, I'm proper milking that...) is as exciting and inspiring as paint drying and begs for a caption competition. Don't get me wrong, the quality of the picture is fantastic but if I want to watch two people in pitch black with a torch I'll turn on The X-Files. Honestly, I actually felt a bit down and even hoped it might be the Stay Puft man they can see. Wow, watch out for that twist. 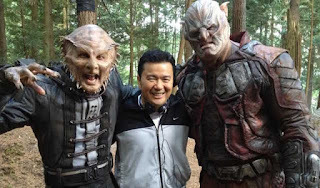 The second image posted on First Contact Day (April 5th) brought two new aliens and Justin Lin smiling. Apparently these are individuals he's worked with previously but no-one seemed that bothered and instead crossed their fingers/suggested/hoped that the alien to the left of the pic was a Jem'Hadar. Now I'd love for Beyond to recognise the larger Star Trek universe and the elements that shows such as Deep Space Nine brought to the franchise but, aside from the jawline tusk pieces I just don't see it. If it is then I'm horribly disappointed they've been "remastered". The second guy on the right looks like a sort of orcish prison thug/guard although if these are "secret" guest stars then they might be relegated to the background. As fans we're crying out for more footage, more bits of information to get us excited but at the moment there really is nothing to suggest we're going to be and I cant make up my mind if Paramount/Bad Robot and everyone else involved almost wants it to be released on the quiet as if they know it ain't gonna be good. Is it an embarrassment? Is it a movie which has been dragged through the mud enough already after all the changing roles, additional writing credits? Is there a genuine concern that this won't be the offering we will relish for the 50th anniversary? Are you desperate for more on Beyond? Worried that we seem to be getting nothing?